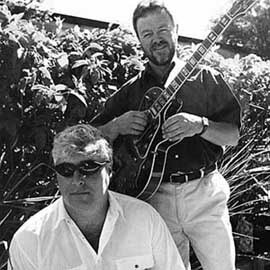 'IT was going to be TWO FAT BLOKES but we haven't got the sidecar yet,' quips guitarist BRIAN SAXBY of his duo with friend CHRIS GILL. This Sunday the TWO PHAT duo will perform a free Sunday concert at THE WETLANDS CENTRE, Sandgate Rd, Shortland, from midday until 2pm. Gill plays saxophone and clarinet, and Brian plays electric and acoustic guitars. Material 'varies from jazz standards to blues, Irish music and a couple of popular contemporary tunes'. Saxby is the husband of JULIE SAXBY who teaches environmental science at The Wetlands Centre, a community-owned non-profit organisation which provides a haven for birds in a dramatic wetland setting. Now in its 15th year of operation, The Wetlands Centre has introduced a range of entertainment to encourage more people to its visitors centre. MUSIC AT THE WETLANDS takes place on the first Sunday of the month. Other attractions include WETLANDS DISCOVERY TOURS, BREAKFAST WITH THE BIRDS and CANOE TOURS OF IRONBARK CREEK. Wetlands volunteer STUART CLARKE said the music was played at the visitors centre. Visitors are also welcome to bring picnics and enjoy the music. Visitors centre manager CLARE CROCKFORD said people were welcome to join the Wetlands Centre. Membership entitlements include free entry, invitations to events and functions and six members' night a year. Yearly membership costs $30 for individuals, $50 for families and $15 concession. Otherwise entry costs $5, $10 for families (two adults and two children), $2 per additional child and $4 concession.